So, one of my predictions about the Apple Event last week was way off. Apple did indeed announce a bigger, heavier 13" iPad Pro, complete with an optional keyboard and an optional fancy stylus (the Apple Pencil). There are multiple reasons why Apple may have come out with this device. There's a big Apple event scheduled for tomorrow, with the new iPhone a near-certainty. But there's also a lot of speculation about what else might be coming. Happy New Year everyone. Here's my annual list of Apple predictions. Apple today announced that they will acquire Beats Electronics and Beats Music for a total of $3 billion, confirming rumors that have been flying around for the past few weeks. Apple will spend $2.6 billion up front and another $400 million over time. This is slightly less than the original rumored amount of $3.2 billion. There's been a lot of speculation about the reasons behind the acquisition, and why Apple was willing to spend so much money. Here's a roundup of some of the possible reasons. A large number of Apple-related sites are buzzing about the possibility of a "smart home" (or "connected home") system to be announced at the upcoming WWDC in June. I had speculated about this back in 2011... it does seem to fit with Apple's philosophy of taking an existing technology with a terrible user experience and making it better. Let's consider what an Apple-based system might look like. I'm a bit behind on Apple news, so let's catch up. Some last minute predictions for Apple's media event tomorrow. Samsung announced several new and updated products; the one that's garnering the most attention is the Galaxy Gear wrist device. Microsoft announced today that it is purchasing Nokia's devices and services unit, which most notably includes the mobile phone business, Nokia's Lumia series that runs the Windows Phone 8 operating system. Nokia was really the only successful Windows Phone vendor; HTC, Huawei, and Samsung were far behind. I've always told my friends that if Comedy Central and ESPN were available over the Internet instead of exclusively on cable, that would be enough for me to ditch my cable subscription and "cut the cord". I think we're getting there. Viacom and Amazon today announced that a number of shows from Comedy Central (and Nickelodeon) will now be available on Amazon Prime. It strikes me that Amazon and Netflix have become the pioneer "networks" on a new broadcast medium: the Internet. Existing content providers will have to evolve to compete, just as the broadcast networks had to become cable networks in order to survive thirty years ago. My prediction is that some time in the next couple of years, the ABC/Disney/ESPN empire will either partner with one of these outlets or create their own paid streaming service. CBS will follow next; NBC (owned by Comcast) and all the Time Warner-owned stations will come around last. Then we'll finally have an open television market where the cable companies don't have a stranglehold on the terms of distribution, and content providers can negotiate subscription prices directly with consumers. This is how a free market is supposed to work; what we have now is effectively a monopoly. The rub, of course, is that cable companies are also Internet service providers, and may respond to this threat by jacking up Internet rates or metering the bandwidth available for competing video services. So the other part of the equation is that we need a more competitive Internet market, or municipal Internet providers. Of course, stupid states like my own (North Carolina) have legislation to prohibit municipal Internet providers... in order to protect the anti-competitive market that exists today. Sigh. Can you imagine if Time Warner were your electricity provider? If they could, they'd charge you extra for electricity being used for your computer, if they knew you were using it to watch YouTube. 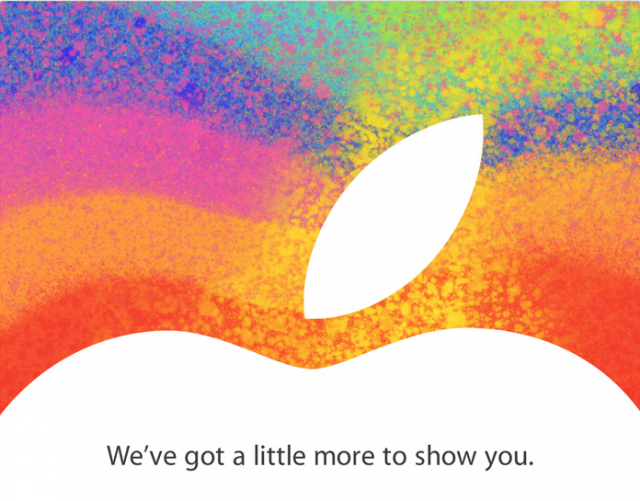 Apple has sent out a media invitation for October 23rd. This is 99% sure to be an iPad mini announcement, but we may get a new Retina MacBook Pro 13" announcement too... that would fit with the "a little more" theme. I usually wait until New Year's Day to make predictions, but I think there's a lot coming in the near future. Here's what I think will happen this fall. New iPhone: 99% likely. Apple will stick to their yearly cycle and put out a phone with a taller display, 4G LTE, NFC, and a new dock connector. The rumor sites are all over the leaks from China, and I think they'll prove to be right. iPad Mini: 75% likely. The tea leaves point in this direction... something like an 8" screen and a $300 price tag, to help reduce the "umbrella" for lower-priced products like the Kindle Fire. It makes too much sense not to be true. New iMac: 75% likely. It's overdue for an upgrade and it remains Apple's primary desktop product. Apple won't cede the desktop market yet, especially with Windows PC manufacturers struggling so badly. New iPods: 65% likely. It's a declining market but still important for Apple. I can see a shakeup in the lineup to help keep it relevant for the holidays. 13" Retina MacBook Pro: 55% likely. My gut says Apple wanted to have this out at the same time the 15" version came out, but supply chain constraints nixed that idea. New Mac mini: 40% likely. It's a good entry-level product and in need of an update, but I can't help but think Apple eventually wants to do something else for the low-end market. New Mac Pro: 20% likely. It's even more overdue for an update, but it's more of a niche product. I think a radical overhaul is coming in 2013, to replace both the existing Pro and the obsolete Server machine. Maybe a modular solution is coming. Apple-branded television set: 20% likely. It's still churning around the rumor mill, but I think it's a ways out. A software update to the existing AppleTV to allow third-party apps seems like a likely short-term upgrade. ... but his legacy lives on. Google announced today its intention to pick up Motorola Mobility for $12.5 billion. In a release, Larry Page explained two reasons for the purchase: to "supercharge" the Android ecosystem, and to strengthen Google's patent portfolio. Let's dig a little into this. Now starting at $100 cheaper ($599), the new Mac mini no longer has a built-in optical drive; instead, you can add an external $79 USB SuperDrive. The CPU is now a 2.3 GHz Core i5 instead of a 2.4 GHz Core 2 Duo; this is a big speed increase. The graphics are Intel HD 3000 instead of an Nvidia GeForce 320M; pretty much a wash. A Thunderbolt port replaces the Mini DisplayPort. It still has 2GB of RAM; memory is slightly faster at 1333 MHz, and there's an SDXC slot instead of a standard SD card slot. Instead of a $999 Server model, there's now an $799 model (with Lion Server available as a $49 download). Hardware-wise, it has a 2.5 GHz Core i5, up from a previous 2.66 GHz Core 2 Duo. It has just a single 500 GB drive instead of the two that the previous server had; it has an AMD Radeon HD 6630M GPU, which is a significant bump. In all, this is a big performance boost for less money than before. It's a nice improvement. The Air models are largely the same as before, except they have an Intel Core i5 instead of a Core 2 Duo. All the models use the Intel HD 3000 instead of an Nvidia GeForce 320M, and they have a Thunderbolt port to replace the Mini DisplayPort. So, this is mostly a CPU speed bump with the move to the Sandy Bridge architecture. The price lineup is unchanged. All the new computers have Mac OS X Lion. Interestingly, these models support re-installation of the OS over the Internet, even if the hard drive has to be replaced; apparently there's Internet network boot code built into the firmware. Nice. Steve Jobs took the stage yesterday to deliver the keynote address at Apple's World-Wide Developer Conference. The main topics: Mac OS X Lion, iOS 5, and iCloud. Apple released a new line of iMac desktops yesterday. Here's the skinny. The iPad 2 was announced yesterday; it will be available March 11 at the same price points as the original iPad. The new version sports a dual-core A5 processor (twice as fast as the A4, with nine times faster graphics), front and rear cameras, and a gyroscope (for better gaming control). It's 33% thinner and 15% lighter. It still boasts a 10-hour battery. It's now available in both black and white, and can use AT&T or Verizon's data network natively. There's a clever magnetically-attached cover option. And you can attach an HDMI adapter to mirror the display to an HDTV. All in all, it's a decent update and it raises the bar for all the copycats. We'll be getting a new one for Amy; I'll inherit her first-gen model. Oh yeah, Steve Jobs was there to make the announcement. Rumors of his death have been greatly exaggerated. "Thunderbolt" connector. This is the copper version of Intel's "Light Peak" technology; it's a single 10GB connection that will eventually replace USB, FireWire, SATA, and HDMI. The connector is physically identical to Apple's Mini-DisplayPort connector (and it's backward compatible), so you can already use it to connect displays. High definition FaceTime camera (webcam). I'm not sure what that will do to upstream bandwidth requirements; I expect most users won't be able to take advantage of the full resolution. CPU changed from 2.40/2.66 GHz dual-core Core2 Duo to a 2.3 GHz dual-core Core i5 or 2.7GHz dual-core Corei7. That's a fairly significant improvement. Standard RAM is unchanged at 4GB on all models. Standard hard drive lineup up from 250/320 GB to 320/500 GB. All in all, Apple sacrificed a few things (battery life in particular) to bump the CPU performance. These will be screaming fast machines. There's no small SSD for the OS as was rumored, and everything has retained roughly the same form factor (including the optical drive). It's being widely reported that there will be a new MacBook Pro lineup tomorrow. A German site has posted what may be the tech specs for the 13" model. Key stats: Intel Core i5 CPU at 2.3 GHz, "Sandy Bridge" chipset with Intel HD3000 graphics, and a new "Thunderbolt" connector (which is Apple's name for the copper version of what Intel calls Light Peak... it's a high-speed interface for peripherals that may eventually replace USB, Firewire, SATA, and HDMI). The new connector would only make sense if there are peripherals designed to connect to it, so keep an eye out for a new Apple Display, or perhaps external hard drive options from third-party manufacturers. An earlier report suggested that some of the MacBook Pro models may incorporate a small (8-16 GB) SSD designed to store the operating system installation only; this would allow for fast bootup times but still allow for larger and less expensive conventional hard drives. It seems plausible but there's no hard evidence for this yet. There were also reports that the optical drive might be removed, a la the MacBook Air. This seems unlikely. Meanwhile, Apple has a media event scheduled for March 2; it's quite obvious that this will be an iPad 2 introduction. There's also a rumor that Apple has scheduled a secret all-employees meeting for Sunday. I'm speculating that Apple will start rolling out an iPhone-based point of sale system, but most Internet rumor sites are pointing to a new business-oriented Genius Bar concept called "Joint Venture"; the idea is that Apple would provide businesses with a paid support option that includes on-site visits. Finally... Steve Jobs: not dead yet. He thinks he'll go for a walk. Also: new giant trackpad for use with desktops, and a new 27" Cinema Display. I'm behind on reporting about some Apple events. Apple came out with a new Mac mini last week. It's about half the height of the previous model, but a little bit wider and deeper. Impressively, it now includes the GeForce 320M GPU for greatly improved graphics performance. The bummer is that the starting price is now $699, which is starting to move it out of the "entry-level" category. Apple announced today that iPad sales have topped 3 million. The funny thing is that a week ago, Forrester Research projected that industry-wide tablet sales for the year would be 3.5 million. They might need to revise that figure somewhat. Apple stock is currently at $274.85. The stock was boosted last week by news of 600,000 iPhone 4 pre-orders in one day; today it jumped again on the iPad sales numbers. Quick rundown on Apple's iPhone announcements today.